As a producer, writer and singer, Nina Nesbitt is now a triple threat. She’s just finished her first American tour and is playing TRNSMT in July. 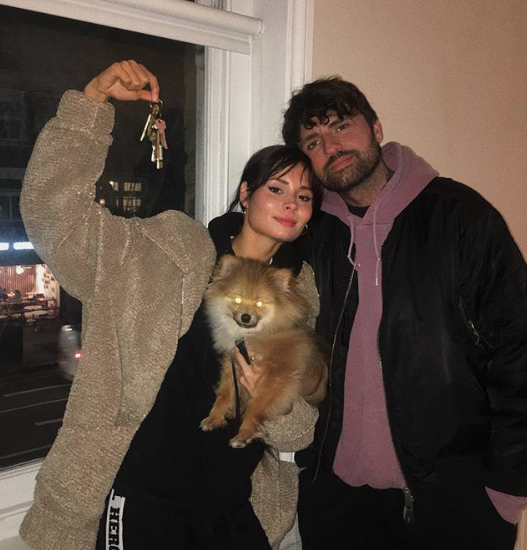 We caught up with Nina Nesbitt to talk about everything from food and fashion, to moving in with her boyfriend and her need for good chocolate. You’ve just finished touring in America for the first time, how was it? Yeah it was amazing, an experience that won’t be forgotten. I’ve always wanted to go so to be able to do what I Iove and see all the places was amazing. It was really cool but the drives were so long, it’s nice coming back to the UK because the drives feel short which is good. There’s also so much junk food I feel like I’ve blocked all of my arteries. I definitely really enjoyed the American tour. Nashville was really cool, I’d never played a gig there before and it’s my favourite city in America so to be around the music vibe there was amazing. The Toronto show was my favourite on the tour, 200 people came, it doesn’t sound like a lot but to me in Canada it is. They knew every word and they did Canada karaoke, it was the most fun gig. How does it feel for your music to be popular worldwide? It’s pretty surreal, now everything is global when you release whereas before it was continent by continent, so to just put something out and let the listeners and people on the playlist team do the work and see where the music is connecting. For me its America that’s the biggest listening in the world so it’s been a natural step to go over and tour. Some of the shows there was 200 people which was insane, you see all these million streams but you don’t know who they are so it was cool to see the fans. You’re playing a show at home next week, are you excited to be back in Edinburgh? Yes, I haven’t been back for ages, I’m always excited to see my friends in Edinburgh, I love Liquid Rooms its one of my favourite venues so it should be good. I’ve had two shows on this leg of the tour now and both have been amazing. In the US, it’s like starting again and some shows will be fifty people in a tiny venue and we didn’t have lighting and stuff like that, so coming back to the UK and having a packed venue is really fun and is like a proper show. We were saying last night it’s so nice to have lights and a smoke machine and people singing all the way to the back of the venue, it’s really cool to be back. What’s one thing you always do when you’re home? Have a chippy, it’s not the same in London. I’ll have a chippy, catch up with friends and that’s it really, chips and cheese. Somebody Special and The Best You Had have had a great response, has this made you more excited about your upcoming album? Yeah definitely, I think whenever you put out the first tracks its always like this is gonna go one way or another they’re either going to get it or not so I had no expectations really, no idea what people would think. It’s been amazing and sometimes things I’d never have dreamed of happening are, it’s really cool. To see people, new people listening and people who have been for seven years and still are, is really cool. Do you have a definite date for the new album release yet? No, I think it’ll be out the end of this year. You have to be so reactive with streaming these days, I’m just going to put it out when it feels right and will work. What made you choose the lotus as your new logo? The visuals haven’t come out yet but basically for the album, and the singles, they all tell a story and it starts off in quite a sad and dark place and throughout it goes on a journey and halfway through Someone Special is the turning point, but I’m thinking of changing that. By the end you’ve found yourself again, it’s about personal growth and its quite an empowering album I feel and is happier towards the end. It’s also the symbol to represent growth, I loved that they grow in murky dark water into something beautiful and bloom and really, I just like flowers. You’re playing TRNSMT in Glasgow this summer, what’s your favourite thing about playing a festival? Probably that it gives you such platform to reach new people, they wanna check out new music. Playing live is the best way to gain new fans. It gives you such platform to reach new people, there’ll be people that haven’t heard of me before or might have heard one song and wanna check it out. It’s a good way to get out to new people and it’s a good crowd to perform to. What festival are you most excited to play this summer? TRNSMT, I always loved T in the park, and it falls on my birthday weekend. That’ll be my first time playing that, I love rowdy crowds so playing Glasgow gigs are always my favourite, a festival in Glasgow will be the best rowdy crowd. Are there any pre-show rituals that you have to do? Not really, I just warm up and it makes such a difference to the show in general and with my band. I have one band member, Jamie, we go through the set in our heads and then go on stage, there’s really nothing rock and roll. You’re writing, producing and performing, how do you balance it all? I’ve written the album then I’ve not really written a song this year, I’ve been so busy. I’ve never been this busy before. I find it quite hard to be creative while doing promos and everything else so I just kind of book end it all if that’s the right phrase. I’m taking some time to live life and do the promo and travelling and tour and get inspired by something else then I’ll write, but I’m just waiting for that to happen. You’ve spoken a lot before about being a female in the music industry, what advice would you give to young girls who want to follow this career path? I think try and find something unique about you, I think now more than ever it’s really hard to build a fan base and break through because so many people are doing it. It’s so accessible now with streaming services and stuff, try find something that makes you stand out and try and imagine something in your head and keep working at it every day until it comes to life. Be strong about what you want and don’t be afraid to know what you want, know who you are before going in to it. There’s also been a lot of speculation around your weight, which you’ve explained is down to a great metabolism, how do you stay body positive when the media are discussing things like your weight? I would say I’m just like any other girl, we all have insecurities. I try not to think too much about it, I’m not a model at the end of the day, I make music. It’s weird being a girl in the industry, there’s a lot more focus on what you look like, especially with Instagram it’s like oh is she pretty is she curvy, it’s a really weird world that we live in so I try not to think about it a lot. Somebody Special is still in the Radio Disney top 30, should fans expect another Twitter fan girl moment? I can’t believe it, I’m so excited! I went to visit them in LA and I thought I was gonna go to Disney World and was so excited but I got there and it wasn’t even in Disney World so maybe one day, but it’s just cool. I grew up a lot with Disney, I would go round to my friends’ houses who had Disney and we’d listen to Radio Disney and its funny to be on it. I had to make a censored version and change some of the lines about drinking, I had about three minutes to change it and so the lyrics are quite interesting. You’ve become a total style icon, what’s one staple you always have in your wardrobe? Big hoops, I’ve always got them in, or I really love high waisted trousers. I’ve got quite a straight body shape I feel like they accentuate my waist more, I love wearing them. But I don’t go a day without my big hoops so definitely those. You and Timmy seem very happy together, do you have plans for another four-legged friend in the near future? Maybe, I’m struggling with Timmy right now cause I’m away so much. It won’t be fair to get another one yet, also my flats the size of a shed so probably not. One day if I have a big house I’d love to have millions of dogs and cats. How has it been living in your own flat in London with your boyfriend Mike? Yeah good, I hadn’t seen Mike in three months until yesterday. We’re both on tour so it’s been a while, but I saw him so that’s good. Hopefully I’ll see him more in summer. I lived in a little village before and there wasn’t many opportunities or people for collaborations, moving has given me more options in that sense. It’s also a huge city so it’s good to live in when you’re young because there’s always something happening. My favourite thing is that you can order food delivery any time day or night that’s the main reason I love it. Do you think both of you being in the same industry makes it easier when one of you has to leave for tour? Yeah definitely, you’ve gotta be with someone who gets what you do. I feel like it’s always difficult for the one that’s left behind, but we’re both away a lot so it’s quite good cause there isn’t a one left behind a lot. What food do you miss most when you’re not in the UK? Chocolate, because we were in America for about two and a half months and I didn’t bring anything with me, I’d never been to America for a long time so I was like they’ll have everything it’s America, but the chocolate is so bad, I had one day in Canada, they have UK chocolate so it’s like the best thing ever, I got my tour manager to bring Cadbury Dairy Milk to me and I put them in my jacket pocket and left the jacket in the hotel. It was like never mind the jacket give me the chocolate. It’s getting shipped to the label in America for my return, I can’t wait. It’s weird it’s like chocolate is a different thing over there. Catch Nina as she headlines the King Tuts Stage at TRNSMT on Sunday 8 July. Grab your tickets here!